I had every intention of making this wreath last year, but as happens every holiday season I simply ran out of time. I love taking something organic and changing it just a bit to make it something bold and beautiful. These are just dried corn husks that I dyed a deep cranberry color and glued to a straw wreath form. I made this over the weekend and wish that I had made it sooner because it’s one of those wreaths that does double duty… the corn husks give it the perfect look for fall and Thanksgiving while the gold bow and cranberry color make it work just as well for Christmas. I love that you could put this up in September and not have to take it down until January!! The best part is that it is so simple but it looks really impressive and no one would guess it was made of corn husks. Make one before Thanksgiving to impress your guests or you still have plenty of time to make them for Christmas! The longest part of this project is dying the husks because they have to sit for 24 hours, but the good thing is you only have to stir them a few times so that step is not labor intensive. I started off by putting a 1 quart plastic bin in one side of my sink… the dye doesn’t stain the bin so you can use one that you use for other things but I just like to have one that’s strictly for dying, that way I don’t have to worry about it. I filled it halfway with HOT water and added an 8 ounce bottle of RIT Liquid Dye in the color Wine. I then added two 8 ounce packages of dried corn husks. I found these in the international section at my grocery store, made by Goya for tamales. 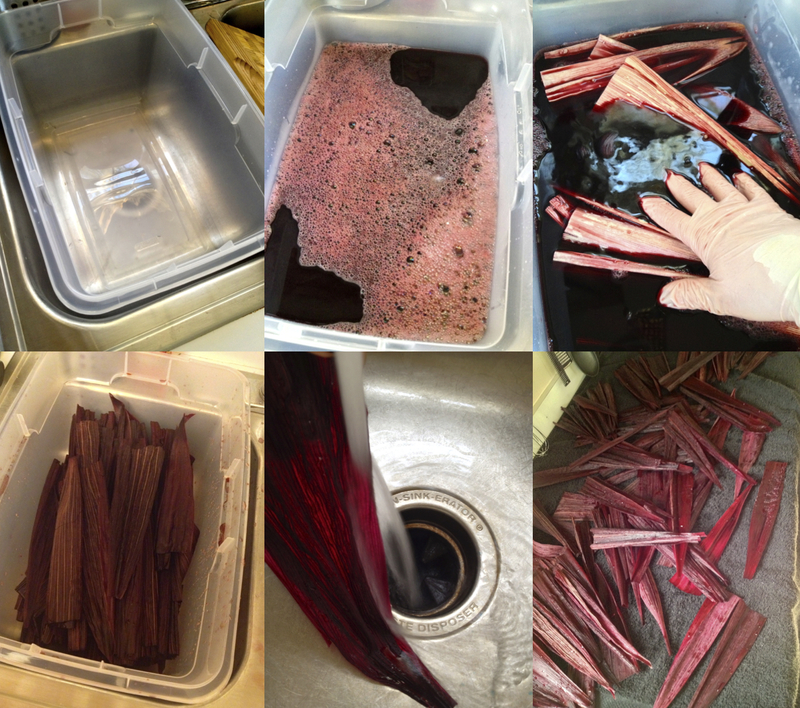 Be sure to wear gloves at this step, the dye will stain your skin fast if not, and push all of the husks down until they’re submerged. Now they’ll need to sit for 24 hours which seems like forever but they need that long to reach the rich color that I got. I kept my gloves next to the sink and stirred them around, shifting the husks that were on top to the bottom every couple of hours, and they all dyed evenly. Once the 24 hours are up, pour out the water and rinse the husks, one at a time with cold water until the water runs clean. You want each piece to be about 2″ wide so you’ll have to rip some of the bigger husks into two or three pieces. Lay flat on a dark colored towel (they’ll still be dripping some dye even though you’ve rinsed them) and allow to dry slightly. 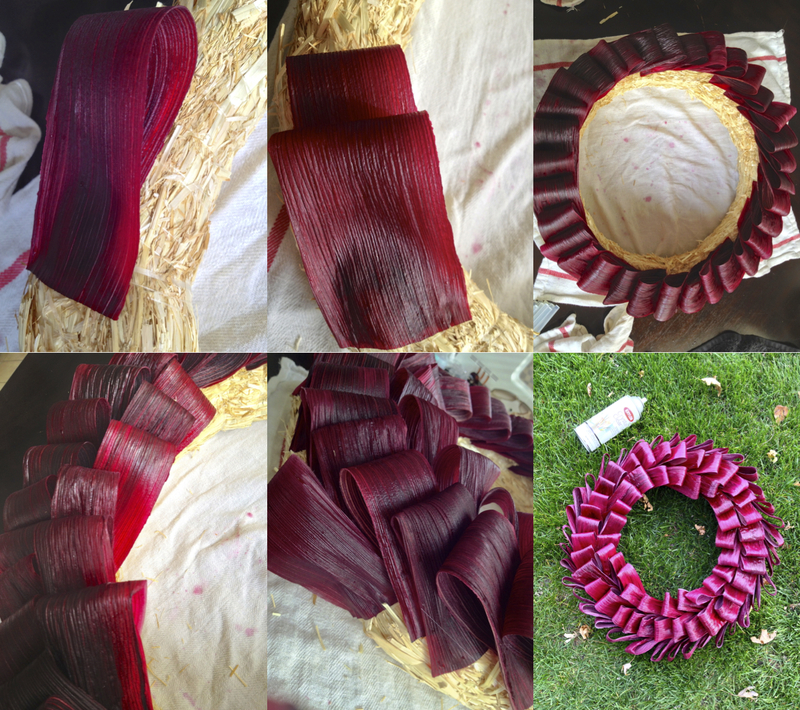 (** I did enough husks to make 3 wreaths… if you want to do one then fill your bin a quarter of the way with water, use half a bottle of dye and just one package of husks). Once the husks have dried slightly (you don’t want them dripping wet but you want them pliable enough to work with) then you’re ready to get started. Take a straw wreath form (I used 16″ only because I couldn’t find one bigger), set it on a towel, plug in a high temp hot glue gun (and have a pile of extra glue sticks handy) and put on a pair of gloves (my hands are still bright red from skipping that last part lol). Take a piece of dyed husk and fold it in half. Put a thick strip of glue along the bottom and glue in place in the middle of the wreath form, with the skinnier part of the husk on the bottom. Continue this, overlapping quite a bit, until you have a ring all the way around the middle of your form. Next start on the inside of the form and make another ring of husks and finally, make a ring around the outside. Make sure you overlap each husk in the same row and the rows themselves quite a bit because once the husks begin to dry they will shrink and you don’t want any gaps. I was a little worried about rain outside about the husks staining my front door if they got wet (even though I rinsed them) so I decided to seal the whole thing with a clear coat. I used Krylon’s Crystal Clear which not only seals with a glossy finish, it’s water resistant so I knew the wreath would last longer. I brought the wreath outside while still slightly wet and sprayed the underside of the wreath first and then the front of it. I waited about 10 minutes and sprayed with a second coat. I added a huge gold glitter bow that I got on sale at AC Moore. I was hanging mine on our front door so I used an over the door metal hanger, but if you want to hang it inside on a wall just thread a small piece of wire through the fishing line that’s wrapped around the form. I am hopefully going to try this in a dark green color for Christmas, I’ll keep you posted on how it turns out! I updated this for fall with some fun glitter picks instead of the bow, you can see that here! Danielle, your creativity is amazing! 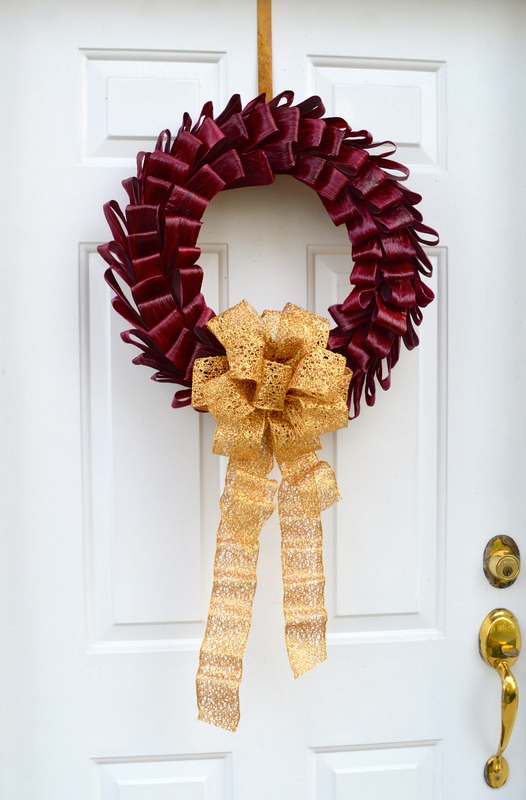 This wreath looks wonderful, esp the cranberry color! Thank you so much! I love the color too! This looks amazing! I definitely want to try making it!! Thanks! I was so happy with how they turned out and they’re so unique!